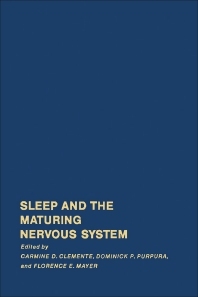 Sleep and the Maturing Nervous System contains manuscripts presented at a conference on Sleep and the Maturing Nervous Systems, held at the Allenberry Inn in Boiling Springs, Pennsylvania on June 21-24, 1970. The program is divided into five sessions: The Maturation of Neural Elements; Neurochemical Factors in Maturation of Sleep Behavior; Development of EEG and Activity Patterns in Relation to Sleep; Development of Reflex Patterns in Sleep; and Developmental Aspects of Normal and Abnormal Sleep Behavior. Organized into 19 chapters, the book begins by discussing the ontogenetic studies ranging from analyses of excitability properties and synaptic processes in single immature cortical neurons to structure-function correlations in developing cortical neuronal subsystems. This is followed by significant topics on the mutual relevancy between brain maturation and the ontogeny of sleep-wakefulness behavior. Additional aspects of the book focus on the developmental implications of conditions that might lead to the establishment of normal and abnormal sleep behavior in maturing organisms. A discussion on the problem of the mechanisms that underlie the unique distribution of behavior states at any particular age and during any particular experimental manipulation is provided along with a comparison of sleep behavior features between normal and mentally retarded subjects of the same age. This book will be of value to researchers and scientists interested in both the genetic and environmental factors determining the brain maturation and its relevancy in sleep and wakefulness.